Enjoy your youth and plan ahead so that you may have good memories and a long and happy life. Almost four hundred years ago Sir Walter Raleigh put forth that idea and committed it to paper. Of course, he said it a little differently but the intent holds up to the test of time. The same holds true in the home improvement realm. Take good care of your shelter and fancy it up before you get too tired to lift a hammer. Looking back to think, "man, I'm glad I painted that ceiling ten years ago so I don't have to now..." is a feel good waiting to happen. Dial us up on the old AM demodulator box or jump into the future and find us on the handy interweb device at Mighty House dot net. See you on the radio! Our new WCGO Mighty House studio is a great place from which to broadcast. This Saturday we welcome Aron and Igor of Mr.Floor to the show. We''ll be talking with Sherry Schultz from Crawford Supply and NARI Chicago will join the show with the latest on the remodeling scene. Picture this: it's Saturday morning and as the Sun slowly sinks in someone else's west, you, yes... you, find yourself in Saturday morning mode. Whatever that means to you - ask yourself a question. You: "Are my ears busy right now?" If you are anything like four out of five dentists surveyed, your ears are just chillin'. 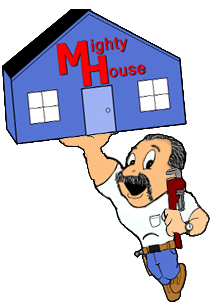 Tune into AM 1590, where you will find WCGO and the Mighty House Home Improvement Show! Get those flappers engaged boys and girls. As another calendar year draws to it's inevitable conclusion, I am faced with the annual realization that there are items on my "Honey do" list that are older than my socks. In question are tasks, long and short, spanning the construction trades, in my face and hidden from view, which defy completion. Despite the backlog, when prersented with a new home improvement challenge, I persist in uttering those fateful words: "No problem... I'll take care of it..." - and on the list it goes. If you see the wisdom in this "Honey-Do-chotomy" and care to share - Please, join us at the Mighty House Radio round table this Saturday. Put it on your list... I'll take care of it. It's that time again. Outdoor temperatures in the mid-west are dropping below the freezing point at night. Consistently cold weather is just around the corner. Remember that garden hose you put out in the spring? If you have not done so already, RIGHT NOW would be a great time to diconnect the hose. In fact, if you do not have a freeze proof hose bib, the water to the outside valve should be shut off inside the house and the valve opened to drain trapped water. If your outside valve handle is not perpendicular to the wall consider replacing this valve with a freeze proof variety. Speaking of cold, tune your dial to the Mighty House Radio Show. Not frozen nor cold, but remarkably cool. Generally speaking... I try to stay away from politics here. I am going to make an exception, but it's not what you think. November 19th. happens to be the day, over one hundred and fifty years ago, that Abe Lincoln spoke a few words at Gettysburg. Allow me to paraphrase...... let's resolve that this nation shall have a new birth of freedom - and our government OF, BY, and FOR the people, shall not perish from the Earth. [We now return to our regularly scheduled program.] Please join us on Saturday and help us celebrate Mr. Lincolns words by engaging in a friendly disquisition on home improvement. It's BYOB and fairly explanatory. And I will see YOU on the radio! (so wear a shirt).